Community Information Information about the community, services, churches, labor force, medical facilities, recreational facilities, museums, newspapers and more. Scroll down for more info. 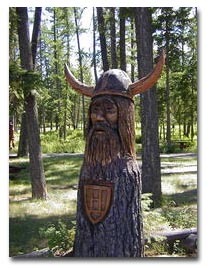 One of several Nordic statues in the Libby Town Park. Libby is located in northwestern Montana, 72 miles south of the Canadian border, 89 miles northwest of Kalispell, Montana, and 35 miles east of the Idaho border. 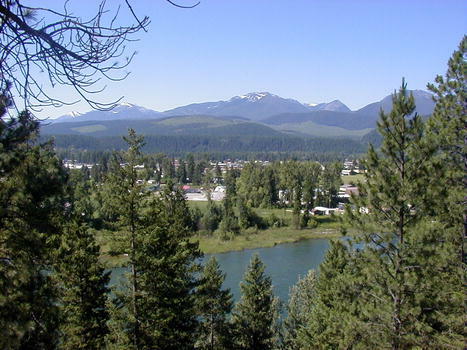 The Kootenai Indians roamed the Kootenai River valley area for hundreds of years before the first white explorers and trappers visited the area. White trappers and miners came to the area in the late 1800s seeking fur and gold in area streams. 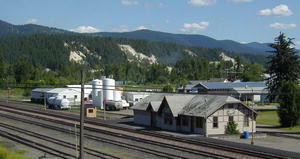 The original townsite of Libby was located several miles upstream from the confluence of Libby Creek and the Kootenai River, but was relocated to its present location in 1892 when the railroad built tracks along the Kootenai River joining Idaho with eastern Montana. Libby was named after the daughter of an early settler. Libby became the county seat for Lincoln County in 1909, the county being named after President Abraham Lincoln. Today, about 12,000 people live within a 4 mile radius of Libby proper. Cabinet Mountains Wilderness Area - Network of trails to high mountain lakes and vistas. Trail hikes range from easy to rigorous. Snowshoe Peak is the highest peak (8,712 feet). Cabinet View Golf Course - 9-hole course with views of Cabinet Mountains. Open to the public. Cross-county ski trails in the winter. Heritage Museum - Historical, cultural & wildlife displays-tours available. Koocanusa Reservoir - 90 mile long lake. Fishing for kokanee salmon & trout, boating, water skiing, jet skiing, sailboating, swimming, numerous boat docks and lake edge camping. Kootenai Falls - Swinging bridge overlooking falls on the Kooteani River, park with picnic area, hiking trails and fishing access. Kootenai National Forest - 2-1/4 million acres for camping, hiking, fishing, hunting, mountain biking, skiing, wildlife viewing. Over 1,450 miles of streams and rivers for fishing. Kootenai River - Blue ribbon fishing, boating, floating. Libby Creek Gold Panning Area - Open to the public on upper Libby Creek. An area gold prospecting club owns claims in the area as well. Libby Dam - Tours of dam in season, day use areas, playground, boat ramp, picnic area, interpretive center . Ross Creek Cedars - Old grove cedar trees south of Bull Lake, informative trail, picnic area. Located 23 miles south of Troy and 3 miles west of Hwy 56. Campground and Bull Lake nearby. Scenic Byway - Highway 37 from Libby to Eureka along Koocanusa reservoir. Turner Mountain Ski Area - 22 miles from Libby on Pipe Creek Rd-alpine ski area. Schweitzer Ski Area (2 hours southwest in Sandpoint, Idaho). Glacier National Park is 2-1/2 hours to the east. *Source: Montana Department of Labor & Industry, Office of Research & Analysis. List includes ONLY private industry employers subject to Unemployment Insurance. Does not include railroads and city, county, state, and federal government agencies (including public school districts and universities). Local internet access is provided by service providers listed below. High-speed DSL and satellite access are now available in the Libby area. MontanaSky.net, www.montanasky.net/. They offer local dial-up internet access for the Libby area and high speed DSL for northern Lincoln County. E-mail accounts and web site hosting available. 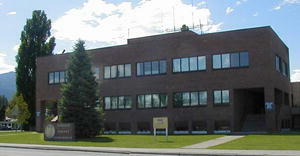 They have offices in Libby, Eureka, Rexford, Kalispell and other towns in Montana. Information obtained as of 2006 Bureau of Labor Statistics. Lumber & Wood Products: Lincoln County is the largest producer of wood products in Montana and 1st in the state in commercial forest land. Mining: Current mining operations are for copper, gold and silver. In the 1960s and 70s a large vermiculite mining operation was located northeast of Libby. This mine is now closed. Libby Convalescent Center: 100 bed capacity providing continuous nursing care for patients. Regional newspapers are delivered daily. Libby receives reception from several radio stations from other areas of Montana and Spokane, Washington. Television: KCFW (9-NBC) Channel 60, Kalispell; KPAX (8-CBS) (Channel 62), Missoula; KXLY, Spokane (4-ABC) (Channel 64). Duane Williams of radio station KLCB-KTNY has a satellite link to carry KUSM, Bozeman, (Montana-PBS), (Channel 66). Railroads: AMTRAK 4 days/week for passengers and freight. Burlington Northern daily freight. Truck Carriers: Two truck companies provide freight service to Libby. One carrier offers terminal service with daily pickup & delivery for 2-day service to Spokane, 1 day service to Kalispell, and 3-day service to Missoula-Portland-Seattle. Other carriers service Libby twice weekly. All page content copyright 2016. All rights reserved. Photos by LibbyMT.com unless otherwise credited.